I was recently at a rather hellish event listening to a presentation on corporate strategy. I’ll summarise it for you – “blah, blah, digital, blah, blah, agile, blah, blah, ecosystem, blah, blah innovation, blah, blah, disruption”. The folks around me were getting rather excited – “Did you hear that? Agile disruption! It’s the future” - and I knew these ideas would be inflicted in an ever increasing number of internal PowerPoint meetings. Hell begets many smaller hells it seems. The problem with words like ecosystem, disruption and innovation is they each refer to multiple things and though they have very precise meanings for specific contexts, relatively few seem to understand this or even the context their companies operate in. Instead we get meme copying, backward causality and the desire to copy others even when it’s not appropriate. “We should be like Uber” sounds exciting but I wouldn’t suggest surge pricing for funeral parlours as a way forward. Understanding context is key to applying these ideas but such situational awareness is a rarity in corporates. The lack of it causes visible symptoms such as poor communication, misapplication of doctrine (e.g. agile everywhere or six sigma everywhere), massive cost overruns in contracts, silos, duplication, constant reinventing of the wheel and a long list of other undesirable effects. 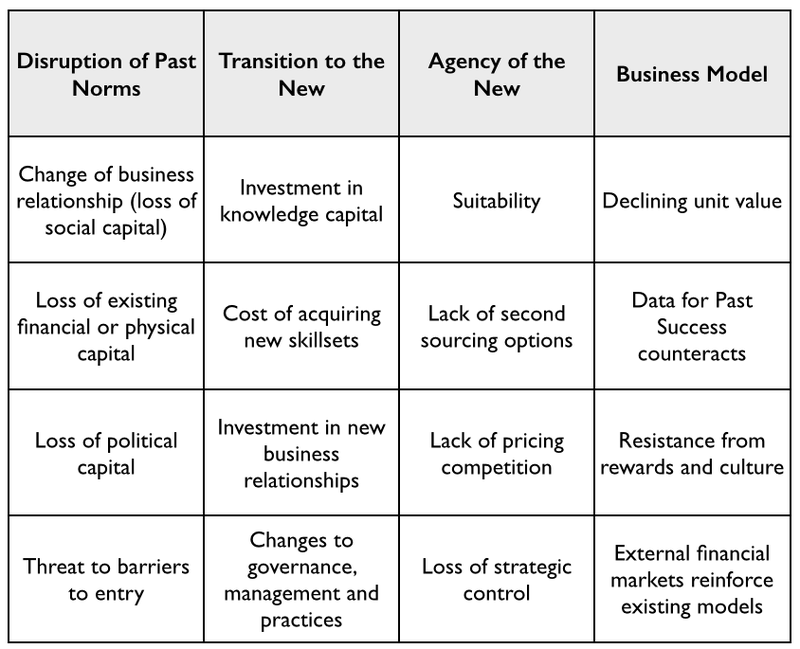 I did want to write a post on the 61 different forms of strategic play and how to manipulate an economic environment but given the responses I’ve received from the Wardley mapping post, it seems something more basic is needed. So, I’ve decided to write a hundred day corporate get fit plan for a newly appointed executive. This will help get you into a position from which you can start to learn and talk about strategy. Obviously, different organisations are at different levels of fitness, so once you’ve completed day 1 then feel free to jump ahead to the appropriate level. Are you a super lean fighting machine or do you just think you are? Let us find out. In table 1 is a simple checklist of things you should have. For reference, I’ve added how often companies seem to believe they have these things. Let’s start with the first section, which is purpose. Ideally your company should have a scope i.e. the reason for your organisations existence, the moral imperative that others can rally around and hence the reason why people believe in you. This can often be found as ‘vision’ statements and they are quite common. Of course, once you have a scope you need to examine how you interact with others and hence you need a list of transactions with others. For reference, the UK Government has over 750 transactions from paying taxes to a license to bury a relative at sea. For reasons of prioritisation, it’s extremely useful to know what the volume and cost of each of these is. Obviously once you have a list, you can always think of other ways you’d like to interact with others but that’s future stuff. This is a get fit plan, so let us focus on the now and put those future transactions in a notebook for safekeeping. Surprisingly, it’s quite uncommon for a company to have a list of transaction with others. I use the word transaction very deliberately here because you’re providing something to others that they value. Every transaction therefore has users. NB, there are times when YOU are the user to other companies transactions i.e. your suppliers. Don’t worry about these for the time being, your purpose in life isn’t to make your suppliers happy but rather their purpose should be meeting your needs. If they’re not then maybe you need new suppliers. Now by understanding your scope, transactions and users we at least have an idea of your purpose i.e. who your company really is. “We’re the best tea shop in Burmarsh providing tea and scones to members of the public” etc. Don’t worry if you’re failing already, this is not uncommon. Many companies have a hard time describing their purpose and this is something we will try and fix in the 100 days. To begin with it’s simply important to be honest as to where you are. We now need to look at the second section covering situational awareness. For each transaction, your users will have needs i.e. a piping hot cup of tea in a friendly and pleasant environment. We simply call this user needs. They will also have wants but that’s future stuff (scribble those in your notebook). It really helps to also have the user journey describing the process by which they interact with us e.g. enters building, selects tea and cake, receives tea and cake, pays for items, sits down etc. This helps us in ensuring the journey is simple, meets with the user need and doesn’t have complex and wasteful steps. Now, each of the user needs will probably require many components to satisfy it e.g. a piping hot cup of tea needs tea, a cup, hot water and someone or something to make it and so on. Of course, those components have their own needs such as hot water needs cold water and a kettle. A kettle of course needs power. So, you can create a chain of needs focused from the visible needs of your users to the invisible components (such as power) that are required to make it happen. We will call this a value chain on the assumption that meeting the needs of others creates value. 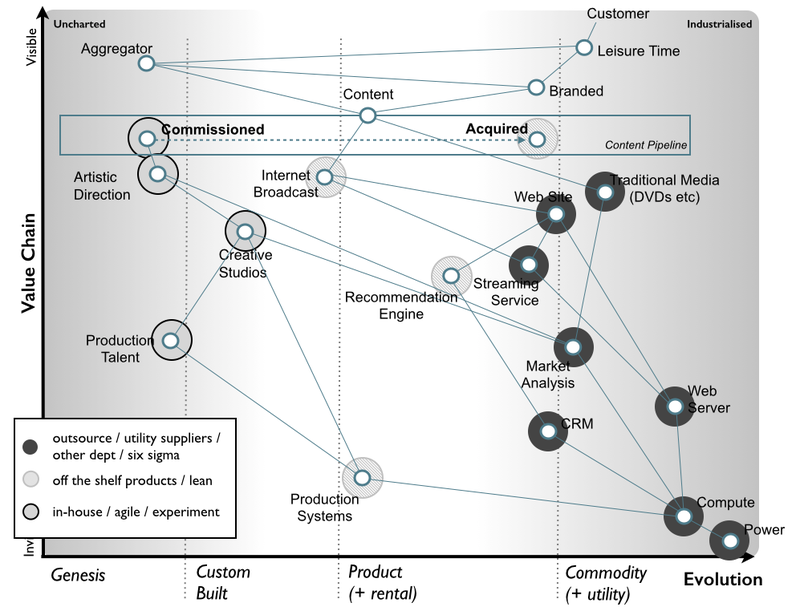 You can now use this value chain to create a map, I won’t go through the details of this as it is covered in the earlier post on Wardley Mapping but these maps enable you to see what is involved (relative position of components) and how those components will evolve (movement). Whether it’s a chessboard or a physical map in a battlefield, position and movement are essential for understanding the context. For reference, I’ve simply included the map from a TV company in figure 1. 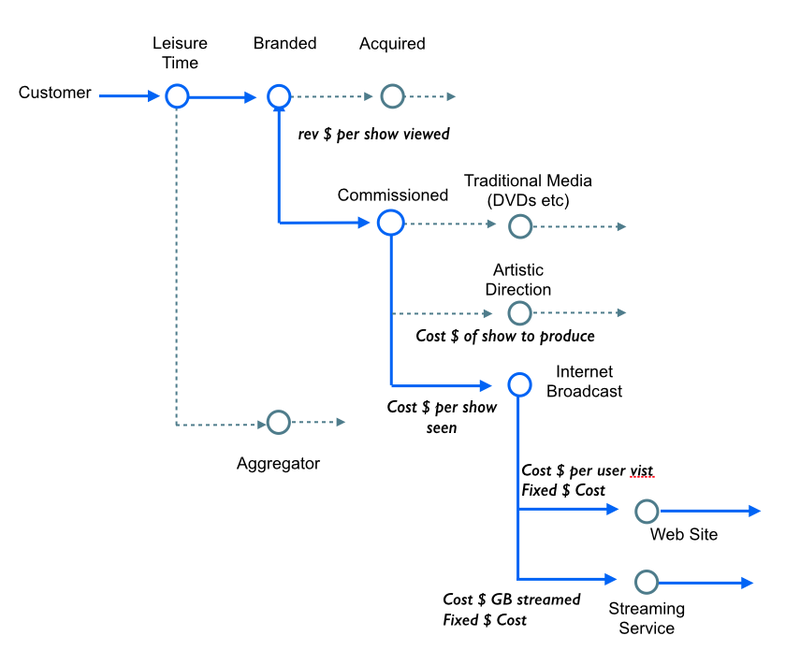 Figure 1 – A Map of a TV company. 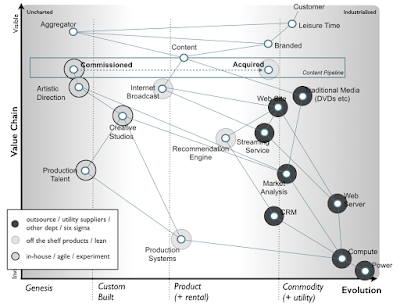 Have you read that post on Wardley Mapping? If not, you really need to do that. It won’t take too long and you’ll find it essential later on. There's no point starting a get fit plan if you're going to skip essential first steps like warming up etc. You'll just cause yourself an injury. Now, if you have maps we can assume you have some understanding of your scope, your transactions, your users, their needs, the components involved and the context. This is actually very rare in corporations, so well done. If you don’t then don’t worry, we can fix that. The third section is doctrine. There are a number of discrete tactics you can use with maps to remove duplication, bias, inappropriate methods and a host of other operational inefficiencies. The scale of bias and duplication in many corporates is quite staggering. To date, the worst example I know of duplication is one large global company that has 380 customised versions of the same ERP system doing exactly the same process. In terms of bias, I’ve seen horrors of customised racks using customised servers in a customised data centre for a company that really doesn’t need to run its own compute. I’ll cover how to fix bias and duplication in a later part of this post. Once you have this all sorted (what I refer to as stopping self harm) then you’re in a position to start learning about common economic patterns of change and applying appropriate structure. This is the point at which you not only understand your context but you’re learning from and adapting to it. This is extremely rare in corporations. Typical symptoms of failure to learn from or adapt to the environment includes bolt on structures (e.g. adding new Chief “something” Officers for every change), meme copying others (i.e. reliance on backward causality), outsourcing failures, lots of duplication including lack of awareness of, and one size fits all methods (e.g. tyranny of agile or six sigma or lean). If this is you then you have problems with your doctrine but this probably extends from little or no understanding of context. This is all quite normal in the corporate world. The final section is where we start to get into leadership and strategic play. However, for our 100-day plan then I will take us up to the basics of doctrine. Until you get to this point then your only strategy should be “Understand what we do, who for and why and try to do it without breaking the bank”. Everything else is meme copying and could easily cause as much harm as good. 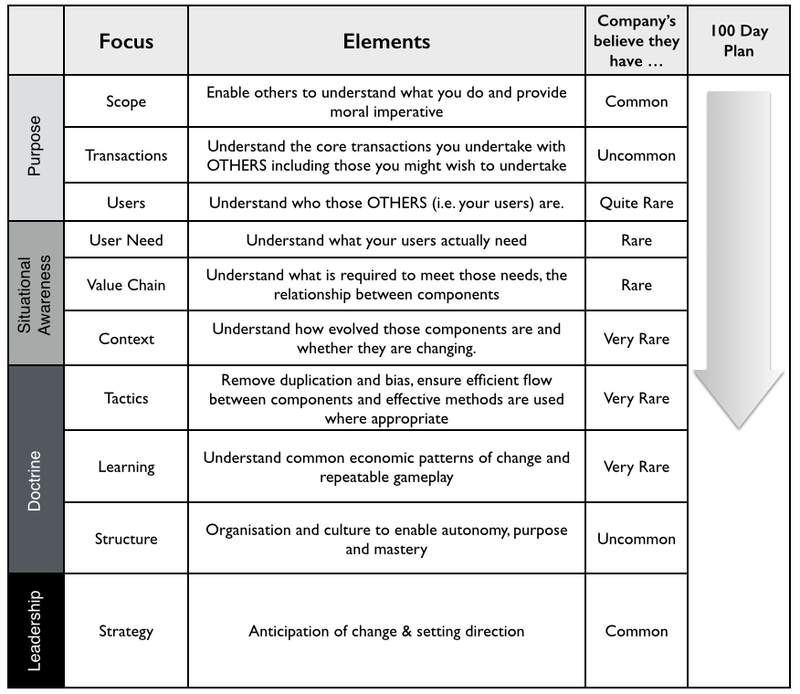 Regarding that table, most companies start failing at transactions, disappear off the cliff at user needs and then bounce back saying “But we have lots of strategy”. That’s surprisingly common. Let us be honest, what they have are lots of aspirational things that they think are a good idea (probably because they read an article on them) but without any context. Surge pricing for Funeral Parlours, it's the next big thing - see Uber! I’m unlikely to get you to the stage of writing an effective strategy in 100 days, however we should get you closer. So, onto the get fit plan. Day 2 to Day 20 - Map it! Ok, the overwhelming chances are that you’re either missing large sections of table 1 or you’re deluding yourself. Don’t panic as you’re in good company. Now, the first thing we’re going to do is collect information but we’re going to need to create a sense of urgency around this as a forcing function. There’s a reason for the 100 day time limit for the get fit plan because if you don’t get the ball rolling in this time then corporate antibodies will overwhelm you. Yes, the organisation hates change and will resist it even when it is good for itself. So get your senior management together and point out that you’re lacking basic information and this needs to change quickly. 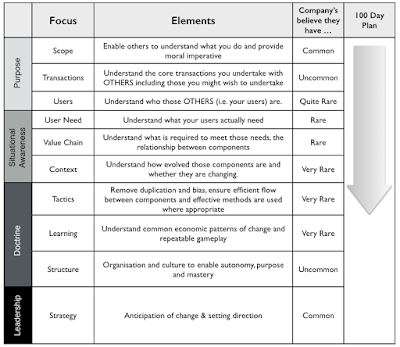 Use table 1 as your guide – “we don’t know our transactions, our users, what’s involved but we’re still writing strategy!” etc. Be reassuring though, just make them aware that change needs to happen and spell out a temporary purpose (you will refine this over time). Now, you should add in some spice – sweet and sour. The sweet bit is you’re going to create a small team to start collecting this missing data i.e. first identifying what transactions you do, who the users are etc. This same team will also start describing the user journey and mapping the environment. You can also announce that there’s going to be NO CHANGES in terms of budget and existing strategy … we continue as are. Hurrah! Whilst everyone is breathing a sigh of relief and you’ve diffused any arguments over “extra work” then you introduce the sour bit. Whilst there is no change in budgets you are going to introduce a spend control process for any project or spend over a set figure. Anywhere between £50K and a £1M will do but if you’re large then start with £250K. There’ll be some grumbling. You’ll have to be firm and reassure them that if they can’t map out what they’re doing, you’ll send someone to help them understand what they’re doing. NB, nobody ever takes you up on this offer. Now the spend control process needs to be run by your newly formed team. Their job is simply to collect the maps, help people map and start collecting all the missing data. Make it easy. Let it run for several weeks and make your team know that you want the entire organisation mapped as fast as possible. Day 21 to Day 40 – Analyse & challenge. By now, you should have a pretty clear idea of the transactions that your organisation undertakes and a good few maps. Your team should have started to collate maps together for several purposes. First, you ultimately want to create an overall high-level map of the business along with maps of the value chains and maps of components in the value chain where necessary. Second, you want to generate a common lexicon within the business – a wiki is a useful tool here. You will quickly discover the same thing is described with different terms in different parts of the organisation. Third, you want to start tackling the duplication and bias that is rife in most organisations. As a rule of thumb, in any decent sized organisation then whenever some group is doing something (e.g. building a marketing system for analysing customer behaviour) then you can normally find five other groups hidden elsewhere in the organisation that are doing the same thing. NB, when you find lots of duplication then every group tends to have people that argue that their way of doing something is special, unique to them or what we call ‘a snowflake’. In fact, most groups tend to think that their thing is somehow different from the rest of the market i.e. they’re the only group who do mass mailing in this way and it’s what makes us unique! This is what we call bias and whilst in cases it has genuine merit, that is the rarity not the norm. I tend to find producing an aggregated chart from the maps (see figure 2) to be a useful technique for highlighting duplication and bias. Simply take your maps, identify common points and plot them according to how people have mapped them. Figure 2 – Aggregated View. The aggregated view helps you determine the lexicon, the amount of duplication in maps, the level of bias (i.e. custom building that which others consume as a commodity) and how things should be treated i.e. the cluster of common points. Now, this is the tricky part. You have to start to introduce some challenge to the process. Up until now the spend control process has been about collection but this needs to change. When someone turns up with a map, you need to point out where the components are much more commodity than they realise or where others are building the same thing. You really need to be asking whether this map is reasonable? To begin with people don’t tend to like to be challenged. You’ll also get bluster such as “I don’t have time for this”, “We have to sign this contract now” etc. You will experience (as I have done) numerous times when someone will be arguing that you need to sign a contract today for £10 million or the world will end. Be prepared to say “no” and to explain that until they produce a map or talk to another group then the project will not proceed. Be prepared for other execs to play power games but stick to the line “If we can’t explain user needs or what we’re actually spending the money on or you can’t be bothered to not duplicate another group’s work then we’re not spending £10 million”. The more maps you collect, the more obvious the duplication and bias will become. This can account for huge sums of money. I’ve seen past projects go from £60M to £800K and £1.6M to £96K just by removing duplication and bias. Don’t be shocked to discover levels of waste that exceed 90%+. It’s not you’re making some sort of mistake; it’s just this level of waste exists and very few have gone looking for it in a systematic way. If you clear out the waste, it’ll give you lots of muscle when it comes to strategic gameplay but that’s why this 100 days is all about getting fit. Also don’t underestimate inertia to change. When you say that someone’s pet custom-built system is best provided as a product or outsourced utility service then expect arguments. There are 16 different forms of inertia (shown in table 2), so be prepared. You’ll get used to them all and learn counter arguments over time. In the first 40 days, you’ve been focused on improving situational awareness (i.e. maps) and stopping obvious self-harm (e.g. 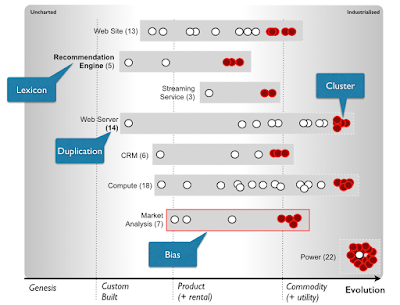 duplication and bias). You should be collecting more of those maps, building up a lexicon for the business and helping people communicate (maps are great for this) along with challenging what is done and helping overcome inertia. You should start to feel a bit fitter and in control but don’t get ahead of yourself. You’re not ready for strategy and gameplay yet. What you now need to change is behaviour in the organisation and you do that through understanding. You’re going to start by explaining to the organisation why one size fits all management rarely works. You can do this by taking a map and showing how you need multiple management methods to effectively manage it. As an example, I’ve taken the media company and marked on how to use agile, lean and six-sigma (see figure 3). Certain parts of the map are suitable for outsourcing and other parts should probably be built in-house. Even the purchasing methods need to change. As a guide, figure 4 provides an idea of where different methods are most appropriate. Figure 4 – A guide for when to use methods. It’s important to realise that on the left of your map you want to be focused on reducing the cost of change. This is because components in this area will change as they are uncharted and unexplored. 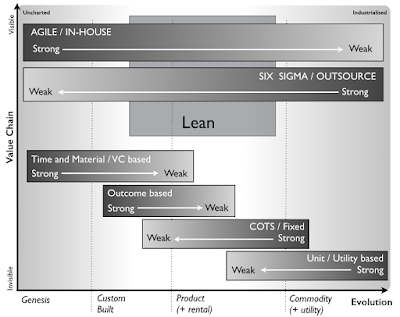 Hence the use of VC based approached, agile (e.g. XP and scrum) and building in-house is appropriate. Experimentation is the name of the game. As the components evolve (which will happen if supply and demand competition exists) then your focus becomes more on reducing the cost of waste i.e. you have an idea of what is needed and you now need to effectively produce it. Techniques like Lean, MVP (minimal viable product), A/B testing and outcome based approaches are all appropriate. You might still use techniques like Scrum for development but the focus (and the artefacts) will be different. As the components evolve further then we’re into volume operations of good enough and our focus must become reducing deviation. Techniques like utility pricing and six-sigma will dominate. This is all about empires of scale, industrialisation and operational efficiency. What you want to get away from is custom building a commodity in-house or outsourcing something novel and new (which will change because you’re exploring an unknown space) to a fixed price development contract with expensive penalties for change. So start challenging those maps not only for duplication and bias but also the methods being used and expect some fierce resistance here. People tend to like one size fits all methods and hence there’s a regular outbreak of semi-religious wars over methods. Keep to the line that multiple methods are needed. In the first days of your new regime, you've probably developed an idea of how much skill your company has and how dependent it is upon others. In many cases, companies lack the skill they need in order to challenge vendors because they’ve outsourced it all or become dependent upon analysts. The maps will also give you an idea what sort of capabilities you require. However, be careful here. In all probability, you are going to find you’re lacking in one or possibly two skills areas and so you’ll have to bring people in. Don’t try to retrofit people you have unwillingly into these areas. If you’ve mainly got people who are good at ITIL, six sigma & strong contracts then you’re going to need these people for those industrialised components. They are really important to you in the long term and so declaring, “we need agile people” and bringing in outsiders can cause a lot of friction. What you want to avoid is creating a “them and us” situation. Be upfront and clear. Use the maps to show you need additional capabilities to bolster what you have. Explain that all parts of the map are equally important. It is critically important to understand that you need at least three basic skill areas – those capable of exploring the uncharted space, those capable of turning a poorly worked concept into a viable product and those capable of turning a product into an industrialised component. These are not the same, and after the 100 days we will look to turn these three skill areas into a cell-based structure and start strategic gameplay. Make sure you have all these capabilities to some degree. It’s also a good idea to start looking into your contracts and have your team mark this up on your map. Ideally, you want small, relevant and focused contracts. It’s worth reading up on FIST principles (USAF, Lt Col Dan Ward) but as an example figure 5 provides a map with how the contract should have been broken up and figure 6 provides how it was. Figure 5 – A more ideal contract structure. Figure 6 – A less ideal contract structure. This map comes from a Government system and the problem with figure 6 is the contract in the middle is too broad. You’ll end up incurring expensive penalties in change control because you’ll be applying a fixed contract to both industrialised components that you can specify in detail along with components that are novel, new and changing and hence can't be specified. Unfortunately, if you only have specification documents and normal box and wire diagrams (business process maps, IT diagrams) then you don’t have a cat’s hell in chance of spotting this problem. Poor contract structure appears to be rife in most organisations. All this time, you still want to keep building that portfolio of maps, getting people to focus on user needs, improving your lexicon, removing duplication and bias but hopefully by now you should also start applying appropriate methods, balancing the capabilities you need, avoiding the outsource everything pitfall along with using appropriate contract structures. You should notice that your organisation is starting to become more efficient and effective, a bit more fit. Are those abs I can see? Now, we turn the pressure up. Position: the position of components simply relates to how things are connected and how visible they are to the user need. 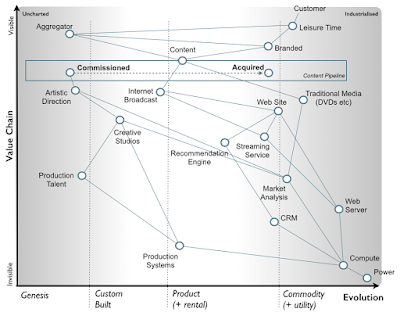 The value chain itself is a chain of needs i.e. this needs that etc. At the top of the value chain these needs are exposed as meeting user needs (i.e. customers) and can often be expressed in terms of the customer journey. This doesn't mean the lower components aren't essential but a user who wants a cup of tea doesn't care about the power provider you use to boil the water. They only care about a piping hot cup of tea. 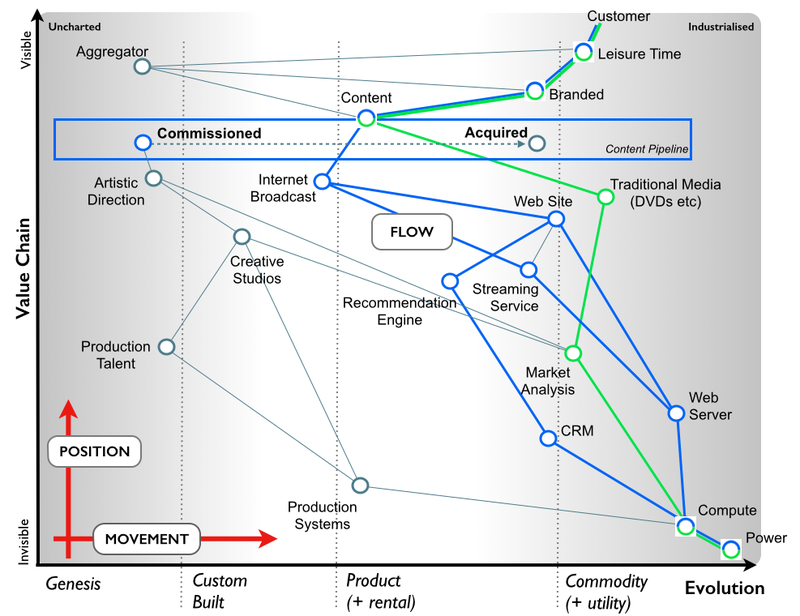 Flow: whenever you look at a value chain then there are often multiple paths within it. These we call flows and along these paths travel such things as information, risk, finance and materials. Sometimes one flow is more viable than another and financial models based upon flow can be developed. Sometimes a flow may be inefficient because it'll have bottlenecks and improvements can be made. There are all sorts of important things to be considered here from inventory to capacity to variability and time. Movement: Unfortunately value chains aren't static. They evolve. 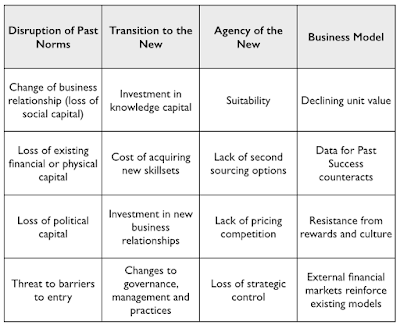 Fortunately the process of evolution is fairly well defined across activities, practices, data and knowledge and there are many common economic patterns, weak signals and gameplay that can be used to anticipate and manage this. There's however little point in understanding the value chain and managing the flow efficiently if you are treating most of the components as custom built when the market treats them as commodity. 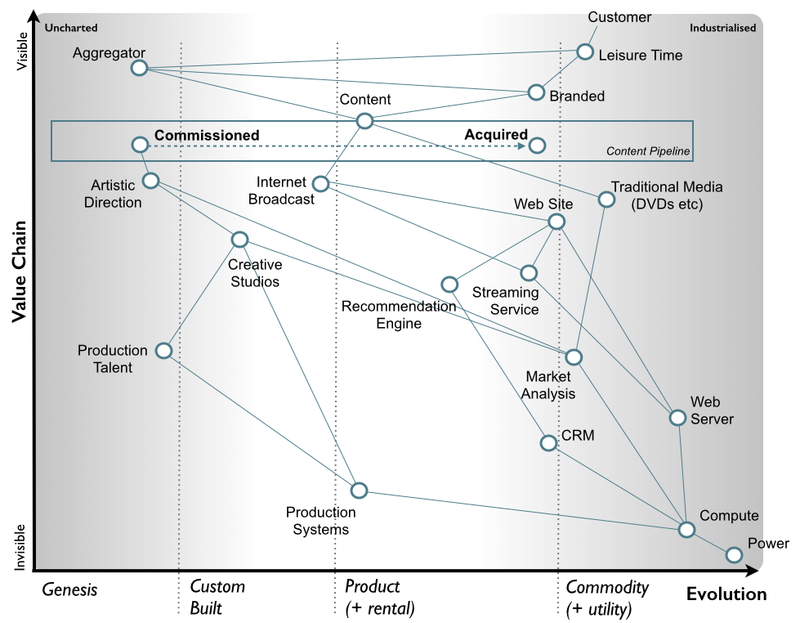 You have to accept that everything in your value chain will evolve (i.e. 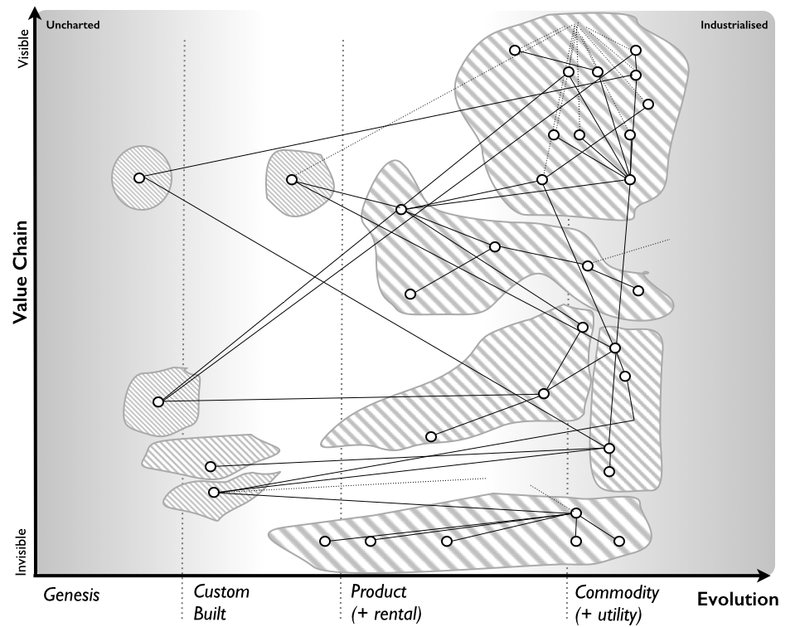 move across the map) and therefore you might be efficiently managing the flow in your value chain but at the same time being ineffective because you're treating components in the wrong way. Managing position, movement and flow are essential operational activities but unfortunately many people fail to understand them. Up until now, we’ve looked at position and movement (i.e. 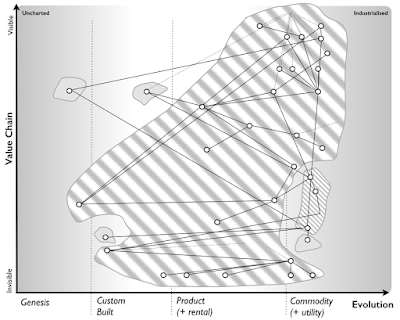 the value chain versus evolution) in the guise of a map. To improve we now need to examine flow in those maps. In figure 7, I’ve taken the TV Company map and marked on two different financial flows (one in dark blue, the other in green). One is for the content provided by Internet broadcasting and the other for content provided by DVDs. 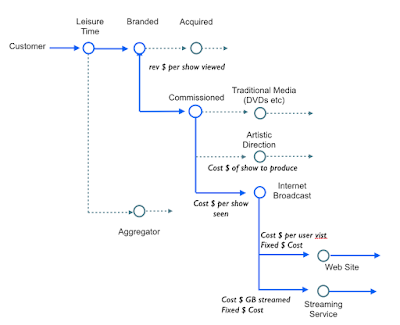 Figure 7 – Flows in the TV Company map. Now for both of these flows, you can create a separate financial model and then examine the flows to determine whether one path is more profitable than another or whether there are bottlenecks in one or another or both. The same process can be used for fault tree analysis to determine risks (e.g. what is the impact if our web servers are lost?) and for the flow of information and materials. An alternative way of viewing the flow above is the use of a message sequence diagram. In figure 8, I’ve provided such a diagram for the blue flow with some examples of what you might wish to consider in terms of financial metrics. 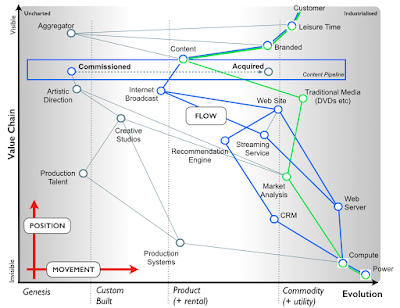 There are alternative ways of viewing these flows e.g. value stream mapping. What’s important to remember is that you have three elements to your map – position, movement and flow. You should not only be making sure you’re effectively treating things (from removing bias and duplication to using the right methods) but also that your value chains are efficiently running. By now you should be motoring in terms of understanding transactions, what users need, improving flow, doctrine and as a consequence you’ll find that mapping helps communication through a common language (Lexicon) and format (Map) across all groups. You’ve been removing bias and duplication. You should have started to balance out the capabilities the organisation needs and even resolved some horror contracts (there’s always a couple). Provide some time to let changes settle in, these are dramatic changes. Keep using those maps, providing challenges through spend control and allow the cycle to improve. By around Day 100, you should also be able to clearly describe your purpose. You're now ready to start examining structure, mechanisms of learning and the principles of strategic play. You're well on your way to playing the competition game with some finesse. There are at least 61 different forms of gameplay and you’ll use multiple of these when attacking a market. The maps will also help you identify where to attack along with where to gamble. However, for most of you today that is still a long way of … you'll need these 100 days before you’re ready to play. I do understand how people are tempted to dive into strategy, learning and structure but there is no point until you understand your context and have removed the flab. I know everyone is looking for the "get fit fast pill" for corporations e.g. "Agile Disruption! ", "Be Digital! ", "APIs ftw! ", "SWOT will save the day!" etc but the pill doesn't exist. These are just memes and its potluck or more aptly potbelly luck if they work. You've got to put some effort in before you can be ready to play the games with confidence. In the next post in the "Get fit" series, I'll cover learning and structure and bring you right to the cusp of strategic play. After that, I'll add a post on strategic play and get back to writing on the 61 different forms of gameplay.